Honda is about to have its second go around with the Honda Accord Hybrid, but this time it has aimed higher. The new model, slated to go on sale in Oct., is expected to deliver 49 mpg around the city and 45 mpg on the highway. That’s far better than the earlier V-6 powered model that was big on performance, but not so much on fuel efficiency. Blue highlights mark the Honda Accord Hybrid. The new Honda Accord Hybrid will be assembled in Marysville, Ohio, a first for Honda. The new hybrid features a two-model powertrain, one that it shares with the Accord Plug-in Hybrid, now available for sale. The SPORT HYBRID Intelligent Multi Mode Driver powertrain enables the sedan to pass through three driving modes: EV Drive, Hybrid Drive and Engine Drive in a bid to provide maximum fuel efficiency and performance as needed. 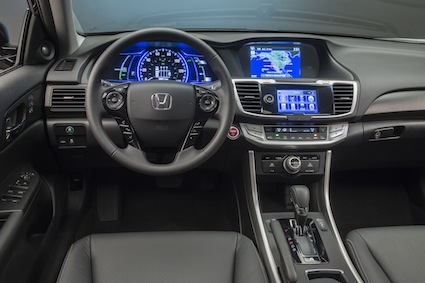 The hybrid Accord utilizes a lithium-ion battery pack that sends electricity to the electric motor to power the sedan at low speeds and at what Honda calls “medium high cruising.” When the Honda Accord Hybrid operates in “hybrid drive” both the 124-kilowatt electric motor and an all-new 2.0-liter DOHC four-cylinder engine team up to provide maximum acceleration power. In “engine drive” the Atkinson-cycle gasoline engine takes over and sends power to the wheels while also replenishing the battery pack. As with all hybrids, regenerative braking is employed to send kinetic energy to the battery pack. With the Honda Accord Hybrid, slight changes to the fascia are apparent. A blue-accented grille and light lenses, unique hybrid badging and LED daytime running lights are found. Honda also outfitted this front-wheel-drive five-passenger sedan with a special wheel design and a rear decklid spoiler. Inside, an electroluminescent gauge display provides real-time fuel economy and energy flow information. The sedan also comes equipped with LaneWatch™ blind-spot display, an innovative safety feature already used in the gasoline-only Accord. The hybrid also makes available lane departure warning and forward collision alert, an 8-inch color display, perforated leather-trimmed seating surfaces, its cloud-based HondaLink™ featuring Aha radio compatibility, a seven-speaker audio system with Bluetooth® streaming audio, Pandora® interface and XM® Radio, and a multi-angle rearview camera with guidelines. The standard Honda Accord has received both a TOP SAFETY PICK+ rating from the Insurance Institute for Highway Safety (IIHS) and an NCAP 5-Star Overall Vehicle Score. Honda expects the hybrid to be similarly recognized. Competition in the midsize hybrid sedan segment continues to heat up. Both the Toyota Camry Hybrid and the Ford Fusion Hybrid are established players, and deliver fuel economy above 40 mpg. The Hyundai Sonata Hybrid and Kia Optima Hybrid are two additional players featuring bold styling, ample standard content and very good fuel efficiency. Among all hybrid models, the Toyota Prius continues to dominate the market, offering four models to choose from. 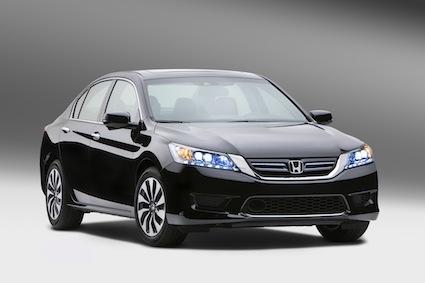 The hybrid market remains small, but with its outstanding fuel economy, the Honda Accord Hybrid may get a serious look. Honda Accord Hybrid photos courtesy of American Honda Motor Co., Inc.